Vancouver, B.C. - The St. Archangel Michael Serbia Orthodox Church in Vancouver celebrated their Church Slava once again this year very festively. Since the feastday this year happen to fall on a Monday this year, the Slava was celebrated on Saturday and Sunday, November 19-20, 2011. 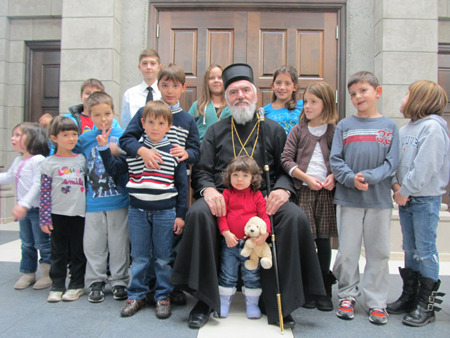 It was for this occasion that our archpastor, His Grace Bishop Georgije of Canada, visited our parish. The bishop arrived at the Vancouver airport on Saturday, November 19 with his deacon Marko Radmanovic and Dr. Goran Popovic, the vice president of the Diocesan council, where he was welcomed by members of the church board and Prota Desimir. From the airport they went to the beautiful church for Vespers. Afterward, the bishop greeted and blessed all the faithful. Following this they went to the chuch hall which was filled with the faithful parishioners, some 500. It was truly wonderful seeing that many faithful who came to greet the bishop and together with their priest and hard working church board members, celebrate their Church Slava. The Slava Kolach was cut and the wheat blessed by Bishop Georgije, with this year's kum Bosko Stajic, who celebrated his 91st birthday this year and it was he who in 1950 in the home “Blue Danube” suggested the name of our Orthodox parish, that it be dedicated to St. Archangel Michael. It was then, according to our custom, that the kum for next year was chosen. Ljubomir Kotur, the secretary of the church board, was picked. After the bishop and the president of the chuch board, as well as the choreographers of the folkore groups Dragana Mrakic and Irena Nikolic, greeted everyone, the cultural program began. The folklore ensamble “Mlada Srbadija”, who celebrated their 39th anniversary and the folklore group “Vuk Karadzic” from our other Vancouver parish of St. Sava, as well as the orchester “Stari Zvuci” performed during the program. Besides them Baja Ivkovic and Roza Kovacevic offered a scene from the Serbian writer Bora Stankovic. The parish children from the Church School “St. Vasilje of Ostrog” also performed at the church amphitheater for which we thank all parish teachers. At the end of the program, which lasted to late in the evening, plaques for special recognition were given to the Kolo Sestara “Kosovska Devojka”, the chuch choir “Obilic”, the soccer club “Beli Orlovi”, the school “St. Vasilije of Ostrog” and group “Mala Srbadija”. This beautiful cultural and spiritual event is thanks especially to the value given to community and love for our youth shown by both Vancouver churches and the unity among the boards of both folklore groups. That which was once a dream of many is today a living reality. Glory to God for this! The crowning moment was on the next day, on Sunday November 20, when the Holy Hierarchical Divine Liturgy was served with Bishop Georgije of Canada officiating with the concelebration of Prota Desimir and Deacon Marko and the singin of the church choir “Obilic”. The festal Litiya around the church also took place. Bishop Georgije delivered a very wam and inspiring homily and wished everyone a very joyous Church Slava. That evening Bishop Georgije visited Prota Desimir who was celebrating his personal Krsna Slava. Afterward the bishop was taken to the airport for his flight back to Toronto. A very heartfilled thank you goes to our diocesan bishop, Bishop Georgije and all people of good will who celebrated these feastal days with us.